The spectacular sunshine on Sunday, April 15, 2012, added to the joy of the celebration of the life of Frank Brancato, a Wedgwood resident who died in September 2011, just after his 96th birthday. Friends and family gathered at the Center for Urban Horticulture for Frank Brancato’s memorial service. Frank Brancato was born in New Haven, Connecticut in 1915, one of nine children of an immigrant Italian family. The family struggled greatly during the Great Depression of the 1930s. At age 26 Frank was still trying to put himself through college by taking night classes, when World War Two began in December, 1941. Dr. Frank Brancato (1915-2011) He was the first president of the Wedgwood Community Council in 1987. In 1942, about a year after the war started, Frank was drafted. He did well in basic training but after being sent to North Africa with his unit, Frank made the decision that in good conscience he could not carry a gun. The chaplain of his unit said, “no problem,” and arranged to transfer Frank to serve in the medic unit. There Frank found his true calling, microbiology. He gave the Army outstanding service as a medic caring for the troops and in finding faster ways to diagnose the exact strain of what was causing illnesses such as malaria and hepatitis. Late in the war Frank’s unit went to southern Europe in pursuit of the retreating German forces. It was found that, running short of soldiers, the Nazis had begun conscripting young boys and old men as cannon fodder. Frank was put in charge of the care of these German and Italian prisoners of war, and he found particular joy in showing compassion to them as they were the bedraggled remains of the shattered Nazi war machine. At Frank’s memorial service on April 15, 2012, a volunteer with the Veteran’s History Project told of highlights of Frank’s military experiences, and that the oral history recording has been sent to the National Archives in Washington, D.C.
After the close of the war in 1945 Frank was able to complete his college education using veteran’s benefits, earning a Master’s Degree in Microbiology at Boston University. He then enrolled at Washington State University to earn his PhD. Most of Frank’s professional life was spent as Chief of Clinical Microbiology at the US Public Health Services hospital in Seattle, where he worked for almost thirty years. Post-retirement, Frank started a new “career” as a community activist in the Wedgwood neighborhood. 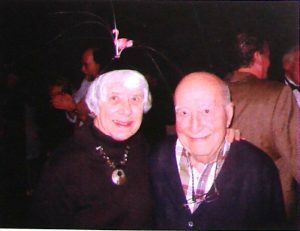 With his wife Dorothy he founded the Wedgwood Community Council in March 1987. The Brancatos consulted city service advisers at the Lake City Neighborhood Services office, and they visited the Maple Leaf neighborhood association which was one of the early groups to organize under Seattle’s then-new community council program. Wedgwood had had a community club which was active in the 1950s and 1960s but it went inactive in the 1970s. In the 1980s the Brancatos realized that Wedgwood had no community advocacy organization. They saw the need for the Wedgwood neighborhood to reorganize and have a voice in issues such as the preservation of trees, and street and sidewalk improvements. Frank & Dorothy organized and inspired others to join the new Wedgwood Community Council, and Frank served as its first president in 1987. The legacy of Frank Brancato lives on in Wedgwood as he provided the framework for today’s neighborhood involvement in issues such as zoning, commercial development and interaction with the City of Seattle in services. Valarie is a volunteer writer of neighborhood history in Seattle. This entry was posted in community council (present time) and tagged community organization, neighborhood activism, Seattle. Bookmark the permalink.